Continuing attacks and intensifying rhetoric are placing India-Pakistan relations under growing pressure. India’s northernmost state of Jammu and Kashmir (J&K) is under pressure on multiple fronts. A string of militant attacks in the Kashmir Valley in recent months accompanied by incessant shelling across the Line of Control (LoC) separating Indian- and Pakistani-controlled Kashmir over the last fortnight has set alarm bells ringing in New Delhi. To add to the tension, the Jammu region was convulsed in Hindu-Muslim violence last week. Indian security analysts are warning that the recent violence in the Valley – the main bone of contention between India and Pakistan – could presage the start of another phase of armed violence in J&K. On March 13 this year, militants attacked a camp of the Central Reserve Police Force (CRPF) in Srinagar, the state’s summer capital, killing five CRPF personnel and injuring ten others. Another encounter between security forces and militants less than a fortnight later left three Indian soldiers critically wounded. 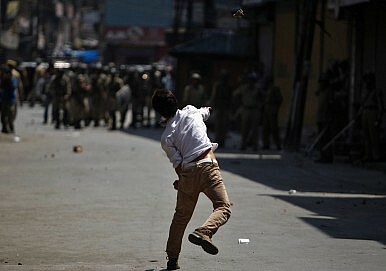 Two major attacks followed in June, one of them on the eve of Prime Minister Manmohan Singh’s visit to Srinagar. Heavily armed militants opened fire on a military convoy killing eight soldiers and wounding 14 others. The attack, widely described as “audacious” given the fact that Srinagar was in a tight ring of security ahead of the prime minister’s visit, is the deadliest in Kashmir in five years. Things were looking up somewhat in strife-torn J&K in recent years. A Ministry of Home Affairs’ Annual Report, 2012-13 released in April this year drew attention to “the signs of considerable improvement” in 2012 over previous years. “The level of infiltration from across the border [with Pakistan] and the resultant terrorist activities in the valley of Kashmir showed a significant decline,” the report observed, going on to provide figures of falling fatalities among civilians, security forces and since 2009. Why are militant attacks increasing? Indian intelligence officials who spoke to The Diplomat blame Pakistan’s Inter-Services Intelligence (ISI) and the anti-India terror groups it backs. “Outfits like the Lashkar-e-Taiba (LeT) have in recent months stepped up mobilizing against India,” an official of the Intelligence Bureau (IB), India’s internal intelligence agency, said. NATO’s withdrawal of troops from Afghanistan is being interpreted by jihadi groups as a defeat for the U.S. “It is encouraging them to rally their followers to fight Indian troops in Kashmir,” he said. Indeed, at a rally in February in Lahore, LeT founder and Jamaat-ud Dawa (JuD) chief Hafiz Saeed demanded that India “leave Kashmir,” else it would face defeat like the Americans in Afghanistan. “No one could defeat the Muslims,” Saeed thundered amid chants of “al-jihad, al-jihad” from his supporters. “If America had to run away [from Afghanistan], then India, you will have to leave Kashmir as well,” he warned. There is a “high possibility” of the ISI stepping up violence in Kashmir “to divert India’s attention away from Afghanistan,” the IB official warned, adding that this scenario could be unfolding already. Will New Delhi look to bring peace to Kashmir by accepting the China-Pakistan Economic Corridor?